RELAX AND TREAT YOUR SKIN to the finest botanical skincare available from Eminence Organic Skin Care of Hungary and La Bella Donna Mineral Makeup. At Posh Organics Skin Care Spa, we use the finest and purest organic skin care available in the world. Handmade in small batches, these products are created from the Earth’s gifts of organically grown herbs, fruits and vegetables, hand-selected to guarantee their highest quality. 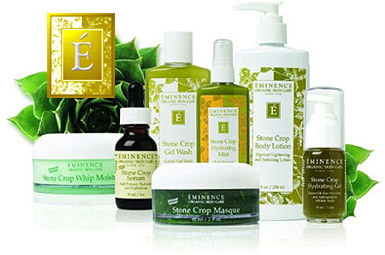 Eminence Organic Skin Care of Hungary is a world-famous organic skin care line featured in 5-star hotel spas. These products are unique because they contain, 96% active ingredients, which is vastly different from most lines which are 6% to 9% active ingredients and mostly water. We carry only the purest skin and body care products, free of parabens (and other chemical preservatives) and synthetic fragrances. Experience for yourself the difference that these fresh fruits and herbs will make in your skin. Eminence has initiated a green spa policy and certificate program designed to reward those actively supporting the green movement while inspiring others to do more in their spas and salons. We’re proud to be one of only two certified Eminence Green Spas in the Pacific Northwest.